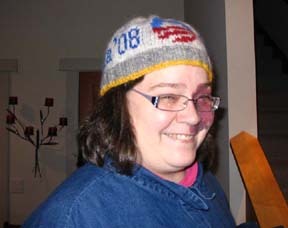 I made this hat for Roberta, a lifelong liberal. Roberta grew up in a very liberal family in a very conservative town. And lived to tell about it! Roberta also had an Obama bumper sticker on her car before most of us even knew he was running. And not the campaign's bumper sticker but a nifty grassroots bumper sticker. Roberta is also a knitter!